With Ski School Alpin you will not have to reserve any equipment in advance. We have enough gear to equip you to your satisfaction. Just stop by to rent! pm and we won’t charge you until the beginning of the following day. so everything needs to fit! 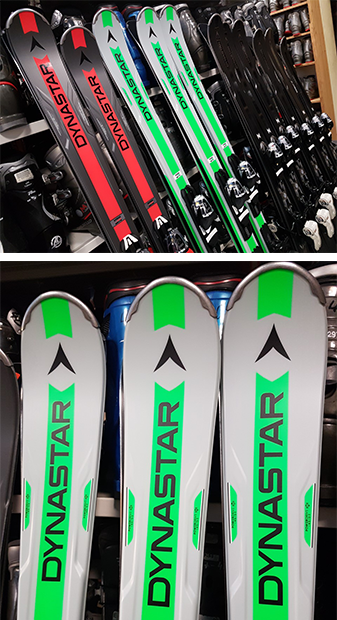 We will adjust your rental skis after we have found the right boots for you. We stock boots from several different companies to ensure a great fit for any foot. We are confident, we can find the right boot for you. Should any boot still feel uncomfortable after a day on the slopes, you can drop back into the ski school and we will exchange the boots free of charge. If you bring equipment from home and it doesn’t fit and we then have to lend you something in exchange, it will cost you double. We offer a discount to large groups, please inquire ahead of time. Please have your equipment checked by a professional before you leave for your vacation. Out of insurance reasons, we cannot adjust bindings other than those of our own equipment. We also cannot mount bindings. Please visit a sport store for these services. Benefit from our expertise and let us advise you, as to which type of skis you should rent. The beginner as well as advanced skier will have a lot of fun on our standard skis. These skis are very easy to turn and control. This is a sporty all-round carving ski, giant slalom carver or slalom carver. The newest top models from DYNASTAR for the highest expectations. To guarantee the correct setting of your bindings we will need your weight, age, height and ability. This ability has nothing to do with the class you might be taking. Please be advised that we will rely on the data you provide us to set the bindings correctly and it is your responsibility to provide us with correct information. Our bindings are checked before each season. Please rate your abilities as a skier wisely to ensure the perfect setting of your bindings. Should you need help determining your abilities, we will gladly help you.